So after we’d done some bits with quadratics and before we hit up circles, I set students a slightly unusual homework task. The students then had to share the link with me via the Google form. Lots and lots of graphs for me to go through! I particularly liked the fact that some students who didn’t trust the link they shared enough and felt it was necessary to add the equation in too! Three graphs is too many for me to go through easily and view responses easily. A simpler and more efficient solution may have been to get students to plot all three in one graph and share that. What I’d really like is a way to record their equations and be able to easily (without copy-pasta) compile them into one sheet, overlay the original and such. But we shall see. Students like Desmos. It was fantastic this week to see a student write that they checked the intersections they had calculated with Desmos. Never would have happened without getting the tool into their hands. 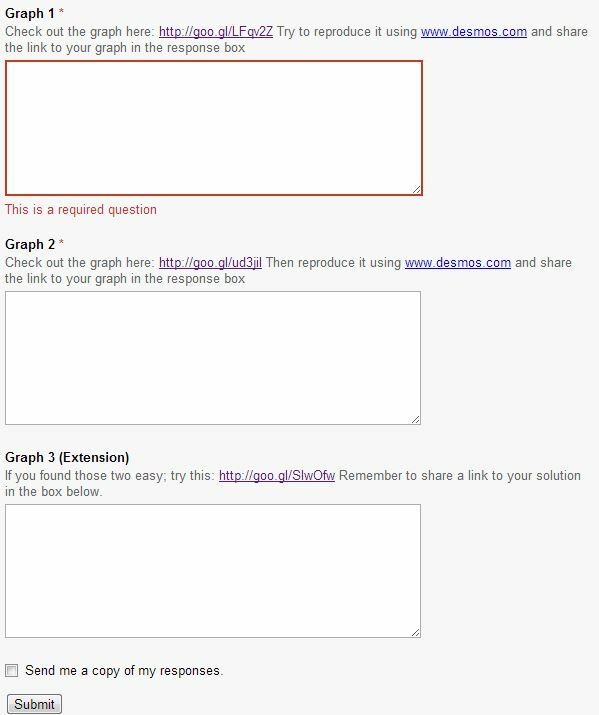 This entry was posted in Classroom, Lessons and tagged Algebra, Classroom, Desmos, Graphs, Lessons. Bookmark the permalink. 3 Responses to Desmos for HOMEWORK!? 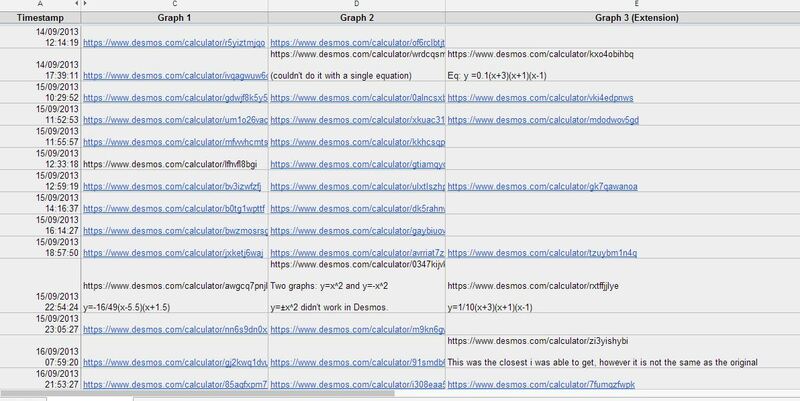 LOVE the idea of having students provide a link to a graph they have made via Google form. Probably going to steal this idea. It does seem like lots o links to go through. But could always just spot check or choose random graphs to check or perr-critique in class.